From there, about three million years ago, llama-like animals dispersedto South America. By the end of the last ice-age (10,000-12,000 years ago)the camelids were extinct in North America. Llamas were domesticated from guanacos in the Andean Highlands of Peru4,000-5,000 years ago, and are among the oldest domestic animals in theworld. Primarily a beast of burden, they also provide native herdsmen withmeat, fiber for clothing, hides for shelter and manure pellets for fuel. Uses include breeding stock, packing, driving, fiber production, therapy,& pets. Llamas are intelligent and easy to train. In just a few repetitionsthey will pick up and retain many behaviors such as accepting a halter,being led, loading in and out of a vehicle, pulling a cart or carryinga pack. Can you use their fiber? Grease-free, light-weight llama hair is warm, luxurious and very popularwith spinners, knitters, weavers and other craftspeople. Are the good pack animals? Many llamas are excellent packers. 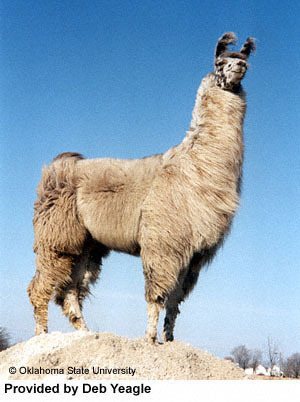 They often carry 25-30 percent oftheir body weight for 5-8 miles, but are not ridden except by children.Their two-toed foot with its leathery bottom pad gives them great sure-footedness.This, and their ability to browse, give the llama an impact on the environmentequivalent to a large deer. Llamas are a modified ruminant with a three-compartment stomach. Theychew their cud like cattle and sheep. Due to their low protein requirementand efficient digestive system, llamas are economical to keep. Veterinaryadvice should be sought regarding feed, vitamin, and mineral requirementsfor specific regions. These highly social animals need the companionship of their species.Independent yet shy, llamas are gentle and curious. Their calm nature andcommon sense make them easy for anyone, even children, to handle. Spitting is the llamas way of saying "Bug OFF!" 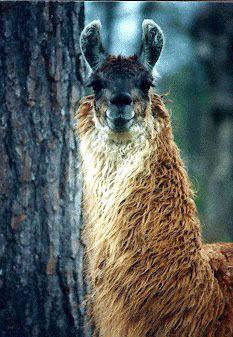 Normally used amongllamas to ward off a perceived threat, discourage annoying suitors or mostcommonly, to establish pecking order at mealtime, an occasional llama whohas been forced to tolerate excessive human handling may have developedan intolerance for, or fear of, humans and will spit if it feels threatened. Height.....40 - 45" at the shoulder, 5'5" - 6’ at the head. Weight.....avg. range - 280 to 450 lbs. Birth.....A single baby "cria" is normally delivered standing mother duringthe daylight. Twins are rare. Babies.....Birth weights average 20-30 pounds. Crias are normally up andnursing within 90 minutes. They are weaned at about 6 months. Reproduction.....Females are first bred at 18 to 24 months of age. 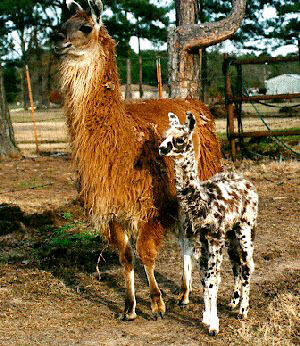 Llamasdo not have a heat cycle, but are induced ovulators (ovulation occurs 24-36hours after breeding). Thus they can be bred at any time during the year. Color.....Hair ranges from white to black, with shades of beige, brown,red and roan in between. It may be solid, spotted, or marked in a varietyof patterns. Health.....Because llamas and their ancestors are specially suited to theharsh environment of their Andean homeland, North American owners willfind them hardy, healthy, easy to care for, and remarkably disease-free.